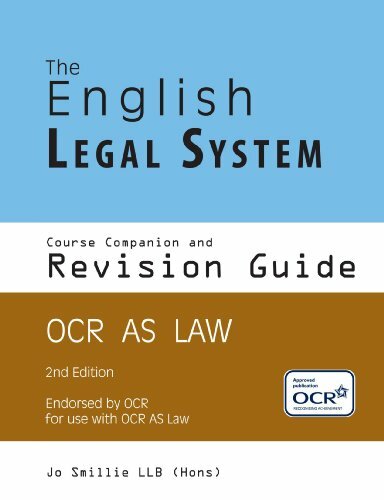 A revision guide with comprehensive up-to-date coverage of The English Legal System. This book offers students an easy to read summary and explanation of the legal rules, displayed in diagrammatic layout. Topics are presented clearly; with each section of the topic summarised over facing pages, to give a clear overview of the key legal rules and evaluation within each topic. The inclusion of cases, statistics and comments adds depth to the clearly outlined and simply explained legal rules – thus providing a basis for the evaluation of the law in this area: A hybrid of a textbook and a revision guide. This book is primarily aimed at students studying AS level law – however, the clarity of explanation, inclusion of cases and evaluative comments, make this a useful resource as an introduction for all students studying this subject for the first time, at any level. Each topic is concluded with an example of an OCR board AS level law exam question; along with specimen questions for the new specification for students starting their studies in AS level law in September 2006. A valuable resource for A level students embarking upon their journey to gain understanding and success in their study of The English Legal System. Jo Smillie is currenlt an A level law examiner for a major examining board, and low tutor ro A level law students. She read Law at University - LLB(Hons) - then obtained a commendation at the College of Law for the LPC postgraduate course. Following an academic path of law Jo has been teaching law for several years to students of all levels; most recently as Head of Law at Godalming College, Surrey.